Travel options between the US and Brazil are expanding in late 2015 when Delta introduces new service to Sao Paulo Guarulhos from Orlando and Azul expands its US offerings with new flights from Belo Horizonte to Orlando and between Guarulhos and Orlando. It is an interesting move for Delta, which presently only serves markets in Brazil from its hubs in Atlanta, Detroit and New York JFK. 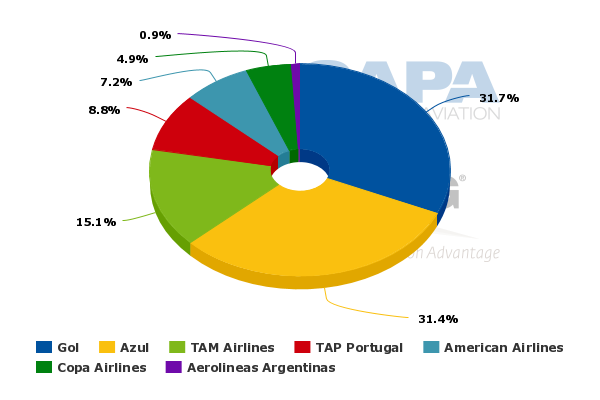 The airline appears to be working to bolster its position in the US-Brazil market as Azul plans more expansion. Delta is leveraging the extensive network of its Brazilian partner Gol with the new service from Orlando. Azul on many occasions has cited favourable results on its new flights to Florida that began in late 2014, and has stated that it intends to push back the launch of service to New York due to a solid performance on routes to Orlando and Fort Lauderdale. The expansion by both airlines is against a backdrop of weak economic conditions in Brazil, but each company is looking to build a foundation to capitalise on opportunities in Brazil once the country’s economy starts to rebound. 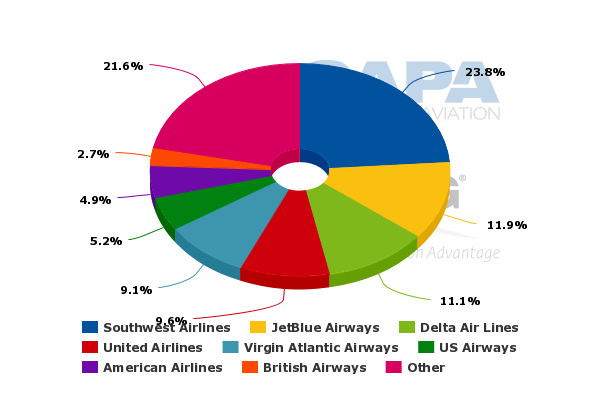 Among the three major US global network airlines, Delta is the second largest airline operating between the US and Brazil with a 14% seat share for the week of 1-Jun-2015. 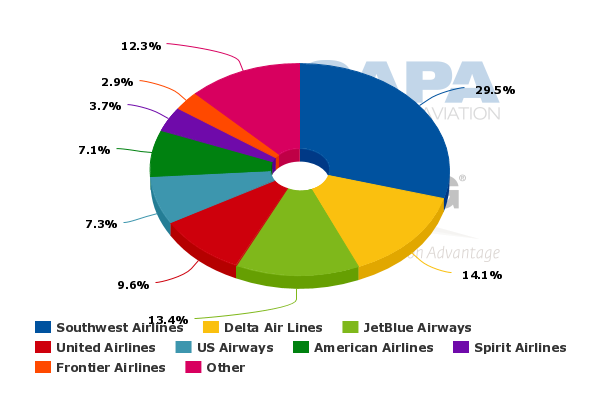 American holds a 38% share, and is also a oneworld alliance partner with TAM, which is the second largest airline overall operating between the two countries. Historically, Delta has not held as strong of a presence between the US and Latin America as American or United, but during the last few years has taken ownership stakes in both Gol and Aeromexico to increase its network utility in Central and Latin America. Delta is seeking approval to launch four weekly flights between Orlando and Sao Paulo Guarulhos, joining TAM on the pairing. Azul also operates between its headquarters and largest base Campinas Viracopos and Orlando. Campinas is located in the state of Sao Paulo, and is roughly 100km north of the city of Sao Paulo. Now the airline aims to introduce flights from Orlando to Guarulhos in Dec-2015. Delta is making a rare move with the new service since it typically operates long-haul flights from one of its numerous hubs. 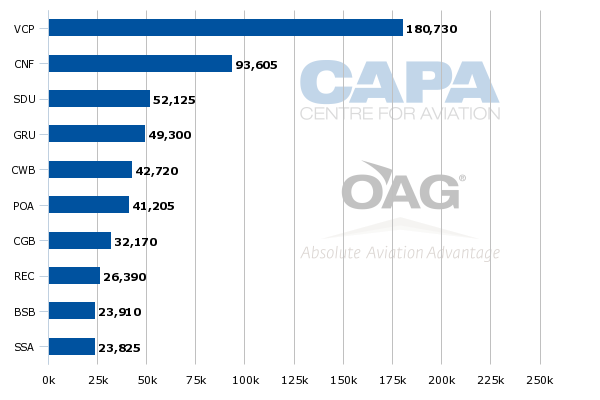 Data from CAPA and OAG for the week 1-Jun-2015 to 7-Jun-2015 show that Delta’s current service offerings to Brazil are flights from its Atlanta hub to Guarulhos, Rio de Janeiro and Brasilia. It also operates flights to Guarulhos from its hub in Detroit and New York JFK. It is likely that Delta’s strategy in Brazil rests on preserving and enhancing Gol’s competitiveness now that Azul has entered the US market, and is planning to enlarge competition between Guarulhos and Orlando. Delta is Orlando International’s second largest airline measured by seats and third largest by ASMs, and it serves numerous destinations from the airport. Gol presently serves Guarulhos-Orlando and Guarulhos-Miami through a stop-over in Punta Cana, Dominican Republic. After Azul revealed its plans to launch flights from Campinas to Orlando, Fort Lauderdale and JFK, speculation grew over how the direct flights might affect Gol’s one-stop offering. Now that Azul plans to add daily service from Guarulhos to Orlando, the competitive pressure on Gol is intensifying. Gol experimented with widebody aircraft during the middle of the last decade, but opted to ground and eventually rid itself of the Boeing 767s that were part of the fleet of Varig, which was purchased by Gol in 2007. Gol’s financial position has been improving during the last couple of years, but the airline has posted annual losses for the last four years, so taking a gamble on the expense of acquiring and operating widebody aircraft is not a particularly viable option for the airline. Delta’s new service is perhaps a way for Gol through their codesharing partnership to market direct flights to Orlando, and each airline should derive some benefit from onward connections on either side of the end destination. Delta’s moves makes it clear that it intends to aid Gol in facing competition from Azul in the US-Brazil market. In addition to the new service between Guarulhos and Orlando that Azul aims to launch in Dec-2015, the airline is also planning to introduce new flights from Belo Horizonte to Orlando beginning in Nov-2015. Azul is Belo Horizonte’s second largest airline measured by seats and ASMs, and the airport is the airline’s second largest base in those same metrics. At the time Azul unveiled plans to launch the new service, the airline’s founder and chairman David Neeleman told news outlet The USA Today that many passengers from Belo Horizonte were connecting through Campinas for service to Orlando, and that many Brazilians living in the US are from Belo Horizonte. For now Azul seems to be focussing its US growth on Florida, having pushed back plans to launch flights from Campinas to JFK. It seems as if the airline has adopted a strategy of connecting points in Brazil to its Florida markets, and it should be interesting to see if Azul opts to connect Fort Lauderdale to Belo Horizonte and Guarulhos. Aside from the direct competition with TAM and now Delta on new service from Guarulhos to Sao Paulo, Azul does not face a lot of direct competition on its routes to Florida. American serves Miami from Campinas (launched just ahead of Azul's new Fort Lauderdale service) and from Belo Horizonte. Previously, CAPA has concluded that Azul’s competitors on the Florida routes were likely dropping prices to retain their customers. During the CAPA Americas Aviation Summit in Las Vegas during Apr-2015 Alex Malfitani, president Tudo Azul did observe that American and Delta had lowered their prices. With two new competitors entering the Guarulhos-Orlando, TAM will no doubt also feel pricing pressure. 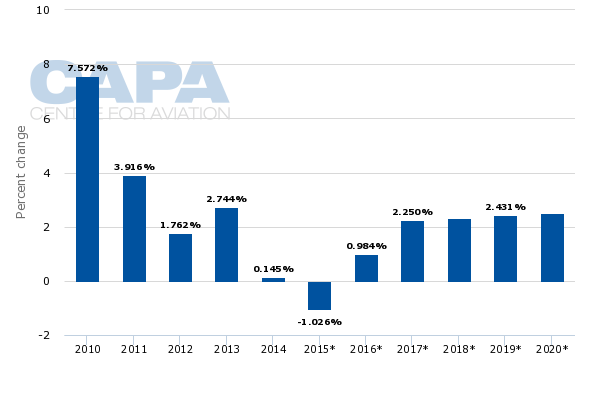 Azul and Delta are introducing new flights between the US and Brazil at a time when Brazil’s GDP projections for 2015 are negative, and its currency has fallen significantly against the USD. As of 4-Jun-2015 the exchange rate was USD1 to BRL3.15. Mr Malfitani noted that most of Azul’s flights were heavily point of sale Brazil, and that over time the airline obviously wanted to increase its US point of sale mix. The first step is catering to Brazilian expats living in Orlando and Fort Lauderdale, characterising those passengers as low hanging fruit. CAPA has also previously cited a New York Times report from early 2015 that stated more than 50% of Azul’s expenses were denominated in foreign currency. 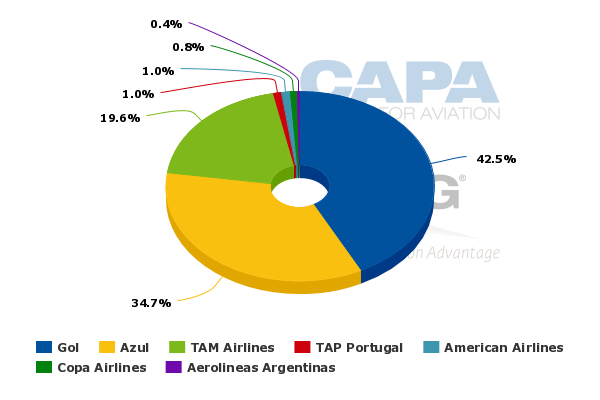 Despite the weakening currency Mr Malfitani stated that demand for Azul’s flights was holding steady, Mr Neeleman told The USA Today load factors on the airline’s US flights have been in the 80s. However, given the pricing pressure from US airlines and the currency weakness, Azul’s yields on the flights are likely low. Delta’s moves in the Brazilian market at a time when the country is facing challenging economic conditions demonstrate that it is willing to aid Gol in fending off competitive threats in the Brazil-US market. In the matter of a few weeks the Guarulhos-Orlando market could jump from one to three airlines if Delta and Azul gain all the necessary approvals to launch their new flights. 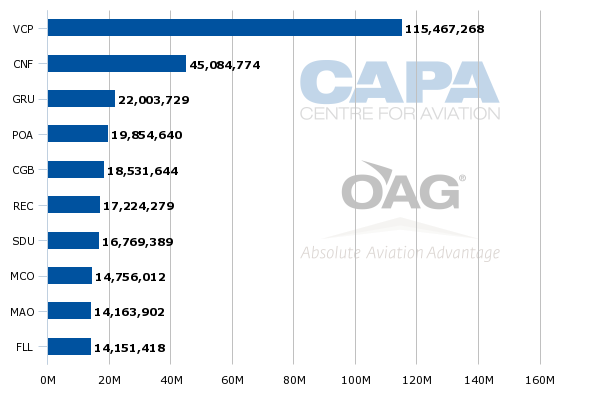 Despite the current economic conditions in Brazil, it remains Latin America’s largest aviation market. So establishing a foothold in the country and into key international markets is key over the long term. That seems to be the end game for Azul and Delta. But in the short term their pricing traction is likely to remain under stress as the competitive dynamics between Brazil and Florida reach a crescendo.